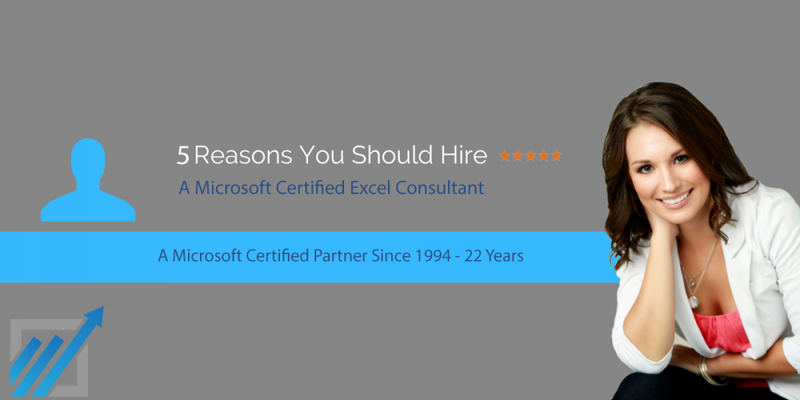 Excel ConsultantWhy Should You Hire Us? If Microsoft Taps Our Expertise To Run Their Business, So Should You. Always know who you are working with – meet our senior team. About Us Elevator Pitch: At Excel Consultant we specialize in building the most complex, advanced, and simple to use applications and financial statements using Microsoft Excel, Access, and SQL Server. As a Microsoft Certified Partner, we always work at the highest of levels. If there is something you need to have done, built by the top experts in the field, that offers a lifetime guarantee on the work, our Microsoft Excel and Access experts are the ones to do it. In addition to creating the documents and applications that businesses use to run their businesses, we are able to make our clients more efficient and accurate in all of the Microsoft applications, allowing them to do things they never did before. Our Microsoft Excel MVPs will cut the time and the cost that it takes your staff to perform the complex, time consuming, manual and repetitive tasks. Our Microsoft Excel Consultant site is powered by the Excel and Access, LLC group of companies which have been in operation since 1994. We are a team of international Microsoft experts composed of professional Microsoft consultants, expert programmers and certified trainers. We pride ourselves in our ability to provide local support with operation hubs in most major cities around the US, Canada, and the UK. We are the only 5-Star Rated, International Microsoft Certified services provider with a 23 year track record of providing superior services to business, government agencies, educational institutions, and individuals. We can then formulate solutions centered around optimizing your current workflow leveraging the power of Microsoft applications. Critical decision-making can make or break a company; and fully optimized, automated and integrated Microsoft applications can empower and enhance the operational aspects of your organization. That is exactly what our Irvine office has done for both the Snack and the Beverage Divisions of PepsiCo, we took the time to fully understand their needs, this resulted in several repeat projects, a glowing testimonial. It has always been our primary goal to exceed the expectations of those businesses, government agencies, and educational institutions that hire us. We go to great lengths to do so. Hiring the best-in-class consultants, programmers and trainers is one example. Quality costs, we all know that, and if you want to be the premier company in this space it starts with those that you hire. So several of the those things we do are listed on this page. Others are on the second set of reasons why you should hire us page. Three of our programmers and consultants worked for PSAV, exceeding their expectations every step of the way. One byproduct of exceeding clients expectations endlessly is the large number of client testimonials and reviews received. In fact one of the best ways to evaluate a company before you hire them is to look at their testimonials. How many do they have? What do they say about them? Do you see a recurring theme? Do you recognize the names of the organizations that write the testimonials? Do they have hundreds of testimonials or just a few, from individuals you never heard of? We stand behind our work; if you find bugs in our work we will correct them free of charge. We also guarantee that you will be satisfied with the work that we do. (Trust me, you will not find bugs in our work). We exceeded LinkedIn.Com’s expectations with our staff’s high standards, hyper focus on satisfaction and exceeding expectations. But don’t take my word on it, read what LinkedIn posted on the LinkedIn.com website for the world to read. Don’t Let this happen to you (Actual Email Received): “They have completed the work for me but the result differs from my instructions and probably need a call with them to get it changed. But i am not so positive on the outcome”. If you hire us once it is more than likely you will hire us again. I say that becuase 83% of our clients are repeat clients, and most of those repeat time after time, for years. That is what happens when you exceed the client’s expectations by hiring the best-in-class experts that properly analyze the client’s needs. But don’t take our word on it, see what Red Bull says about our work over the past several years. …. After having two other firms take on the project and then bail, I was panicked and desperate to get the project completed in what was now a very tight time frame…. Our team of Microsoft experts has provided professional consulting, programming and training services for thousands of clients over the past 25 years. We were hired by Microsoft to develop hundreds of Excel templates that are part of the Microsoft Office Suite. Two of our Microsoft Excel MVPs worked on this project. If you have Microsoft Excel 2013 or 2016 you have our work. It is exciting to know that our Microsoft Excel templates have helped helped millions of people around the globe. If you have not used them they are worth the look, you can see them by opening Excel, click on new, and then pick the Excel template, and/or you can use this link to see all of the Microsoft Excel templates on the Microsoft Website. Our Microsoft Help Forum, VBAExpress.Com has helped hundreds of thousands of people. There you can post questions on all of the Microsoft applications, VBA included. Then some of the best minds in the Microsoft applications provide answers, for free. There are tens of thousands of people on there each day, non-stop from all corners of the globe. Finally, When we say we wrote the book on Microsoft Excel, Access, and Microsoft Office, we did, literally. The books our team has written on Excel, Access, Word, Outlook and ADO have helped hundreds of thousands of people learn how to program in Microsoft Office. The point is this, many of our competitors learned these applications by reading our books. We are comprised of Microsoft MVPs (Most Valuable Professionals), a Microsoft Certified Partner (Since 1994) and of career Microsoft Excel and Access experts, with decades of experience when it comes to implementing and developing custom Microsoft application driven solutions. Our senior team is composed of award-winning specialists, certified by Microsoft, that have specific, first-hand industry knowledge. We know and understand the needs of your organization, be it a business, a government agency, an educational institution, or an individual. Our Microsoft Excel MVPs have worked with the Microsoft Corporation several times now. We developed 70% of the Microsoft Excel templates that come inside your copy of Microsoft Excel. We also worked with Microsoft on several Power BI applications to be used internally at Microsoft. If Microsoft taps our expertise to run their business, so should you. – Microsoft Excel 2013 Template Project, Two Microsoft Excel MVPs worked on this. We have more experience than 95% of our competitors as we have been assisting clients around the world since 1994. You will have to look long and hard to find a firm that can match that level of experience. And we are not going anywhere for at least the next 15 years. Most of our competitors are a company of one (Just them). They often have a traditional day job, and they do either Excel or Access work in the evenings and over the weekend. They are often called the office Excel guru becuase they can do a few things in Excel that others cannot, such as Pivot Tables or VLookups. We however do this fulltime; this is all we do, and we do it at the expert level, such as Microsoft Excel MVPs, Microsoft Access MVPs, etc., the cream of the crop. For example, one of my Excel MVPs is now working directly for Microsoft on the Excel Team. It does not get much better than that. As such we can do the most advanced things such as Power BI and Azure. We have had so many projects where there were up to 5 people working on a project. For example we had a large project in Orange County where we had four Microsoft Excel MVPs working on it full-time, that lasted over a year, with much of that onsite. Having the ability to add as many consultants and programmers to the job as needed, in order to make deadlines is something that we can do, that sets us apart. And here is the important part, we are a fully staffed international corporation and as such we are almost always available and reachable. We are one of the largest and most successful companies in the local and international space, as we have been since 1994. In comparison most of our competitors just came around in the past 1 to 5 years. Christopher, I just wanted to take a minute to thank you for pairing me up with your Excel developer Jacob. I had a fairly sized project that needed to be completed quickly and with accuracy. Not only did he deliver on those parts, he completely exceeded my expectations when it came to pulling my AS/400 data into Excel and formatting it properly for flash reporting. All requests were completed 100% and nothing was left undone. I can’t imagine having anyone else do my Excel development. Great job on providing the right talent to satisfy any customers needs. I have worked with Helen Feddema and Christopher Fennell since 2003. Christopher’s exemplary service combined with prompt and accurate billing makes doing business with him a pleasurable experience. Additionally, Helen’s deep knowledge of Microsoft Access has saved me time and time again from crippling project delays. Her quick turn-around time and accurate work have made her a pleasure to work with as well. Ms. Feddema is an expert MS Access database designer and programmer. She will keep you from making errors when designing your database so that future expansion is not restricted which is critical for a successful, robust product. Ms. Feddema is very quick at understanding and solving problems even when she is not completely familiar with the technical aspects, mathematics, etc. of the project. We are very happy that she is helping us design and program our new database. John Winston Radiological Physics, Inc., (John has worked with three of our staff since 2003). Step 1: Contact Us for a Free Consultation, Step 2: Hire Us, Step 3: Be Happy You Did. We know that you want to know the cost (an estimate) of the work to be done so that you can get company approval. We get that. We would as well. As such, at our company we offer free consultations in order to evaluate your needs, in complete detail. We are then in a position to provide you with a written estimate for the work, both in terms of time and dollars, either fixed-bid or by the hour. If you or your organization needs certified Microsoft experts who’s services get the job done on time and on budget, please give us a call at 877-392-3539 or send us an email or use the Chat window. You guys are awesome! A very big thank you to Jacob for his VBA brilliance and Christopher for being so responsive and prompt in your replies. You guys are awesome! Words cannot express how grateful I am to you guys for your patience and assistance in my VBA project! Excellent job! Wow! This is great. Thanks for the speedy results! I was desperate to find someone that could help me with my Excel scheduling issues and searched the web until I found you. I sent an email saying “Help!” and got an immediate response. You handled my needs with patience and professionalism and actually had my issue solved the same day. Now I can start my freelance job on Monday feeling confident and prepared. I will use you again and gladly recommend you to anyone in need of your expertise. If you are still not convinced that we are the corporation that you should hire, then here are even more reasons why you should hire us. If you want to learn how to successfully Hire a Microsoft Excel, Access or Power BI Consultant, Read The Definitive Guide To Hiring a Microsoft Excel, Access or Power BI Consultant, this link will give you plenty of guidelines to consider.